You don't mess with Bond after disrupting his interrogation. Following the death of Vesper Lynd, Agent 007 (Daniel Craig) pursues the Quantum organization, who seek to monopolize Bolivian resources. 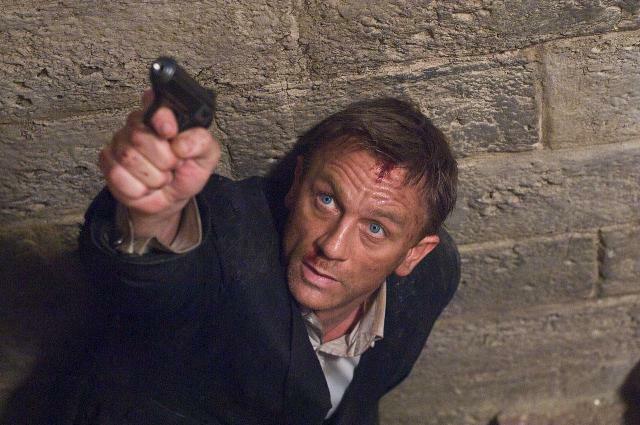 While Bond thinks he’s simply doing his duty, M (Judi Dench) is convinced he is on a violent rampage to avenge Lynd. Despite being the most recent of 22 James Bond films (excluding the upcoming Skyfall), Quantum of Solace is the first true sequel in the franchise, following up 2006’s Casino Royale. As a result, Quantum of Solace was much more story driven than many of the earlier Bond films, much more akin to Casino Royale. The biggest issue I had was that Quantum just felt like it was giving me too much and too soon. It felt more like one action sequence right after another. While over-the-top action goes with the territory in Bond, and I thought they were extremely well-made in Quantum, I felt I didn’t get the chance to reflect on the plot that I would have liked because there were no lulls in action. I liked Daniel Craig as Bond in Casino Royale, and I liked him in Quantum as well. While he is still a womanizer, it seemed like that was given a backseat, especially in Quantum since Camille (Olga Kurylenko), despite being the “true” Bond girl of the movie, did not actually have a sexual relationship with him. That is likely to highlight the fact that Vesper Lynd from Casino Royale was (at least in the Craig continuity) Bond’s one true love. Besides that, Craig seemed a lot more believable as someone recruited to MI6 from the Royal Navy. It may be because of his somewhat thuggish disposition, but in general Craig seemed a lot more physically threatening than the likes of Pierce Brosnan or even Sean Connery. For this Bond, I think it was a wise decision to reduce his dependence on gadgets as Q started running wild in the Brosnan era. Overall, I will say Quantum definitely had personality, but the story left something to be desired particularly because of how forgettable the villains were and how Bond was barely given a chance to keep up with the frantic script. For that reason, I can see why people found Quantum to be so disappointing when compared to Casino Royale, the movie that rebooted Bond after the lackluster Die Another Day (2002). Nonetheless, despite being a character created by Ian Fleming in the 1950s, the Craig films did a good job of keeping Bond relevant in the 21st century. Much like The World is Not Enough, I would say while Quantum would appeal to more loyal Bond fans, Casino Royale is still the best Bond film to have been released since GoldenEye.